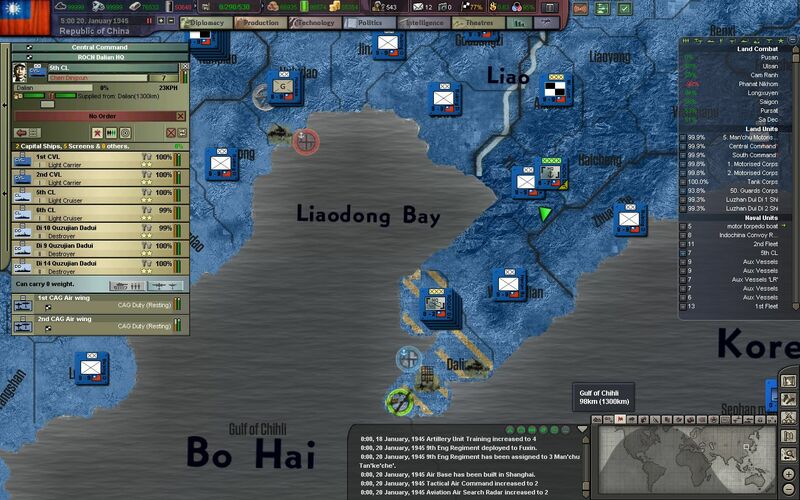 Hi all, and thanks for reading Episode 15 of my Republic of China AAR in BlackICE 8.6. If you missed the previous episodes, they are linked below. 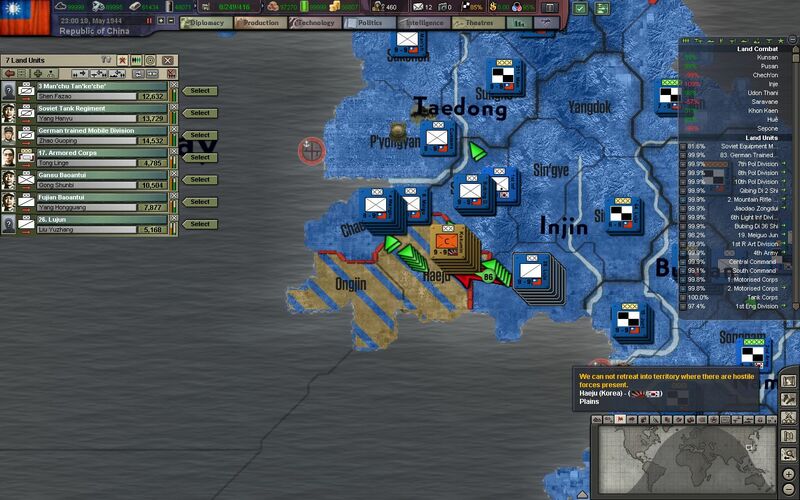 The piecemeal invasion of Korea begins to wind down as Japanese conscripts are pushed down the Ongjin peninsula, south of Pyongyang. Nearly 100,000 survivors of this landing surrender soon after. The jaegers of the 24. and 25. Light Army continue their bloody slog through the mountains and jungle of eastern Thailand. 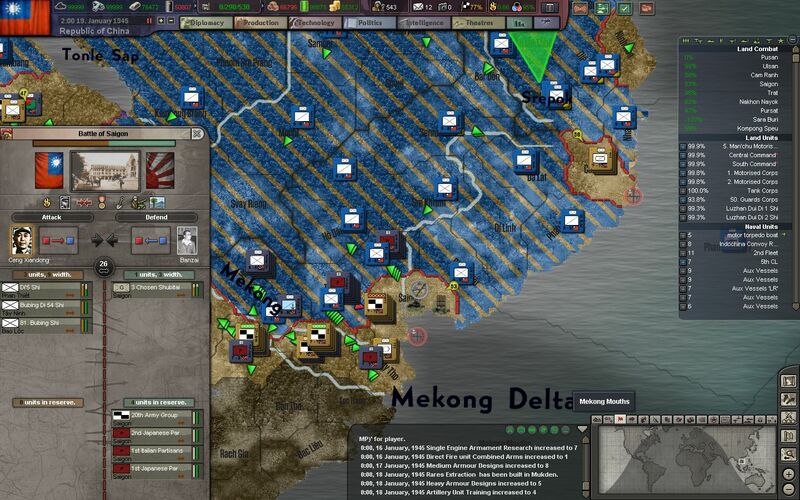 Our campaign in Indochina relied on our troops reaching the Mun River head in the West at the same time as our troops reached Hue on the coast, but now it looks like we will have to sweep through Vietnam to get to Bangkok first. The ROCAF begins scoring more and more kills on Japanese convoys. 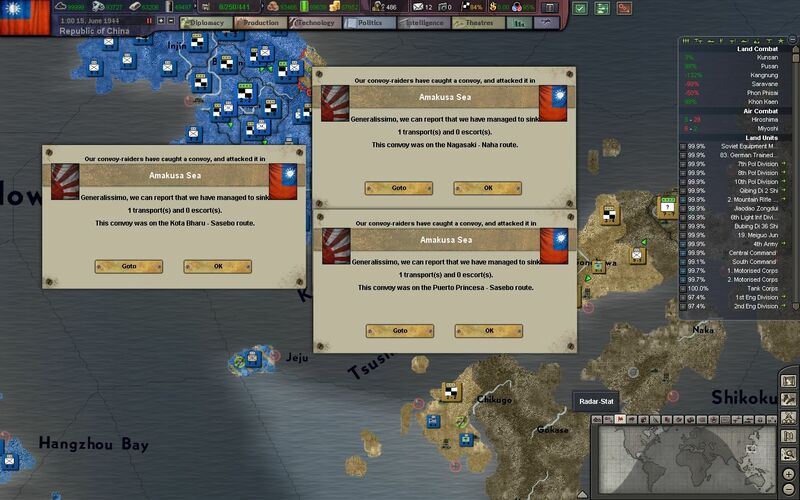 The strained Japanese supply network, which must supply troops all across the Pacific, is beginning to fall apart at the seams. More and more pockets of Japanese beachheads are crushed, and one more remains to the north at Kangnung. The newly formed 51. 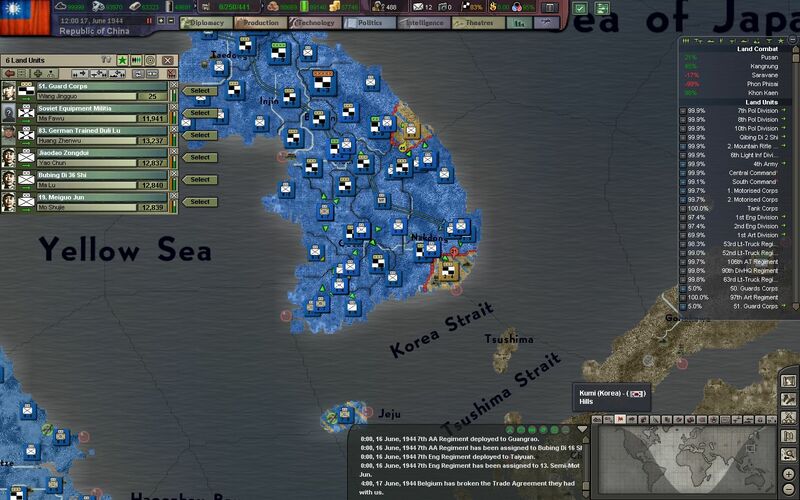 Guard Corps is transferred directly under Army Group Korea, to put an end to the siege of Pusan. The men of the 51. Guards Corps are hardened veterans of the War of Resistance, the War in Indochina, and the final campaign against the communists at Yan'an. Armed with the latest small arms, the heaviest artillery, and led by the best officers, these brave men will charge into any fight and win any battle. The formation of this fighting corps is just one of many battlefield commissions to come - and is given to troops who have performed exceptional in combat. Another corps, the 50. Guard Corps, is formed from veterans of the Japanese landings at Qingdao and Nanjing. 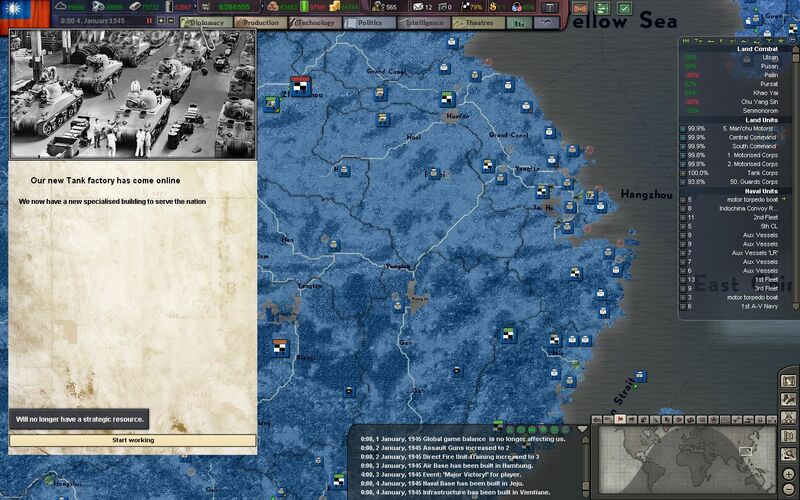 With the imminent defeat of the Japanese at their last foothold in Korea, Pusan, they appeal for an armistice in order to save the skins of those still trapped in the city. 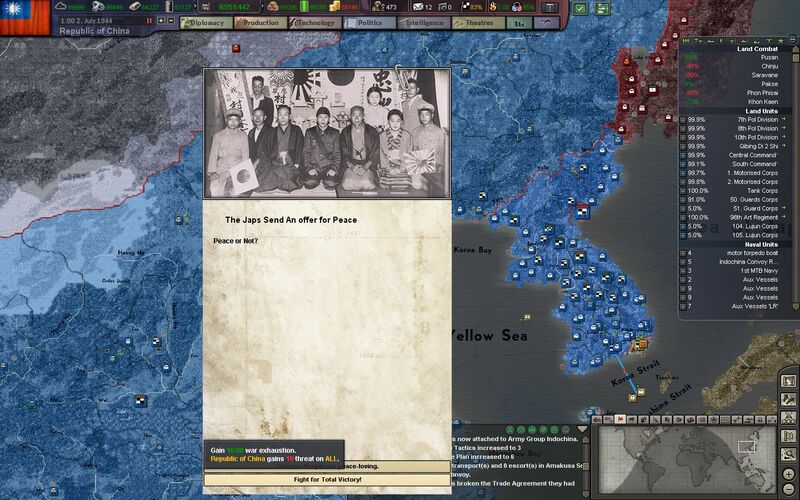 Chiang himself is present to deny the terms of peace. 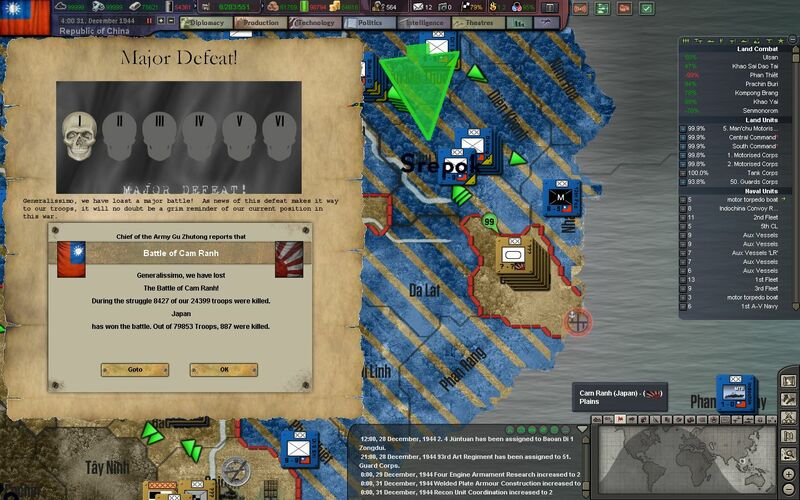 The people of China have endured the barbarity of the Japanese for nearly 8 years now, and we will accept nothing short of an unconditional surrender. 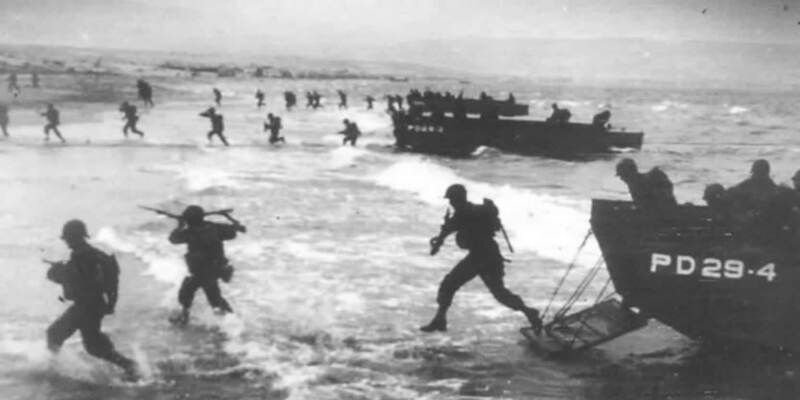 Meanwhile, the US and UK combined forces launch Operation Overlord, the invasion of Nazi-occupied France. 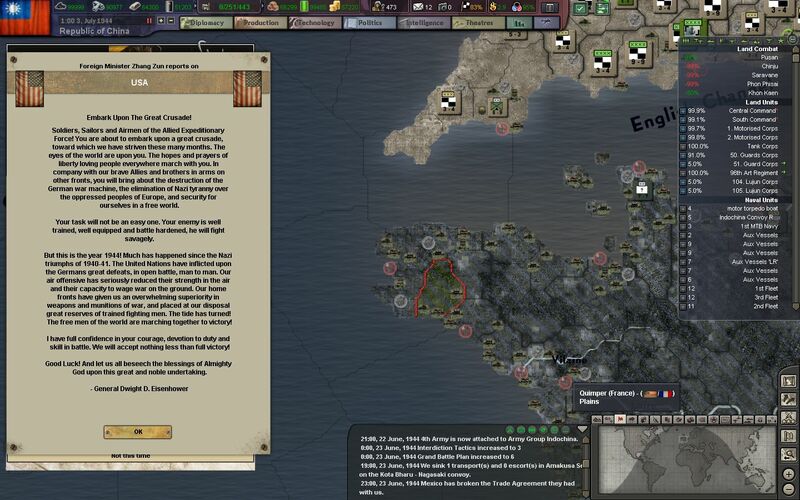 US marines and armored divisions first land on the shores of Brittany, with the intent of moving inlands fast before they can be cut off on the peninsula. 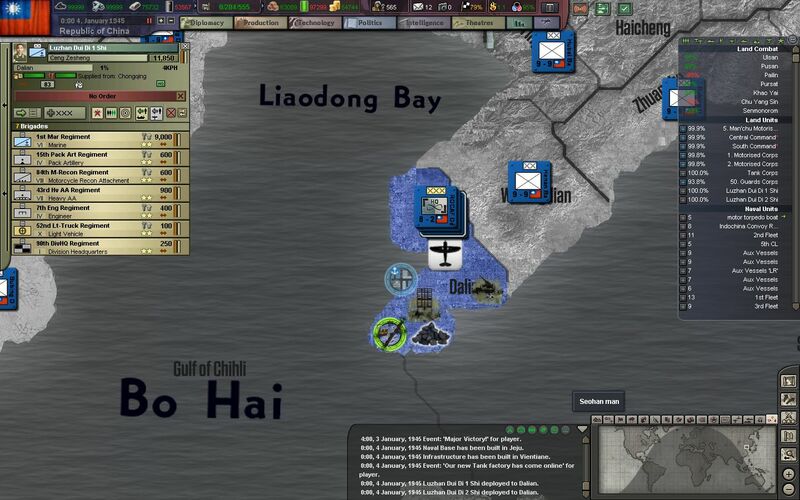 After some initial setbacks, we are able to push the Japanese out of the air and radar base of Hue - the first main objective of the first phase of Operation Ballroom. 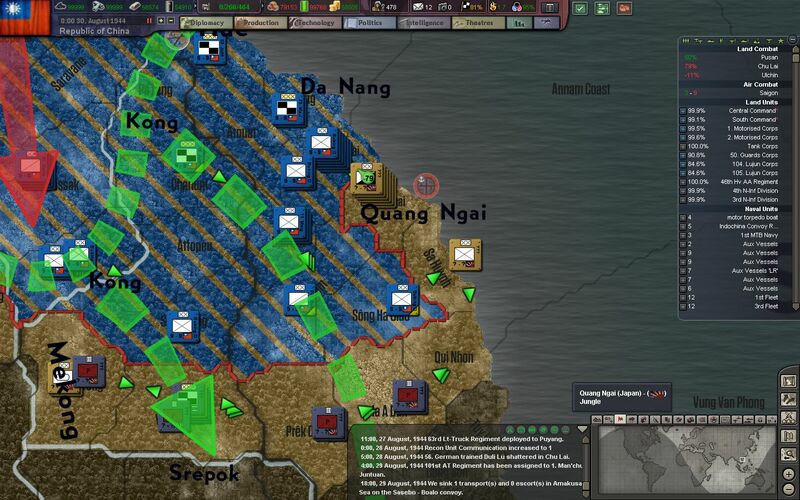 We expect little resistance going down the rest of the Vietnamese coast. As the frontline moves further and further away from the Chinese heartland, more and more of our industry and economy can function without worrying about Japanese bombings or naval landings. 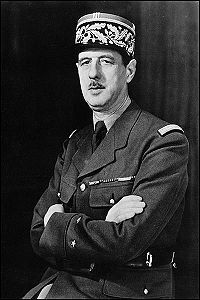 Although the Charles de Gaulle and the Free French government-in-exile has appealed to Chiang to temporarily relocate their government and operations to Hanoi, their requests have been refused on the grounds of the continuing offensive and the ever present threat of a Japanese landing. 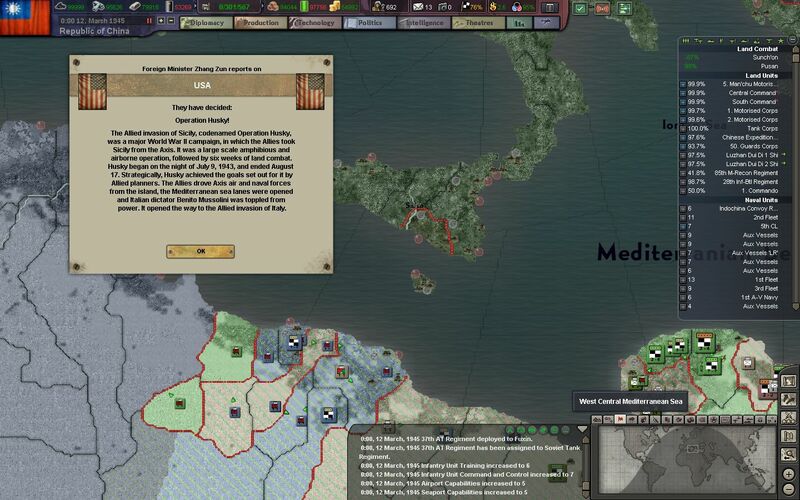 A provisional military government is formed out of the remnants of the French protectorate of Tonkin in Hanoi, and is placed directly under the control of Army Group Indochina. The populace there is largely given autonomy, except in the cities and in military installations left behind by the Japanese and French. 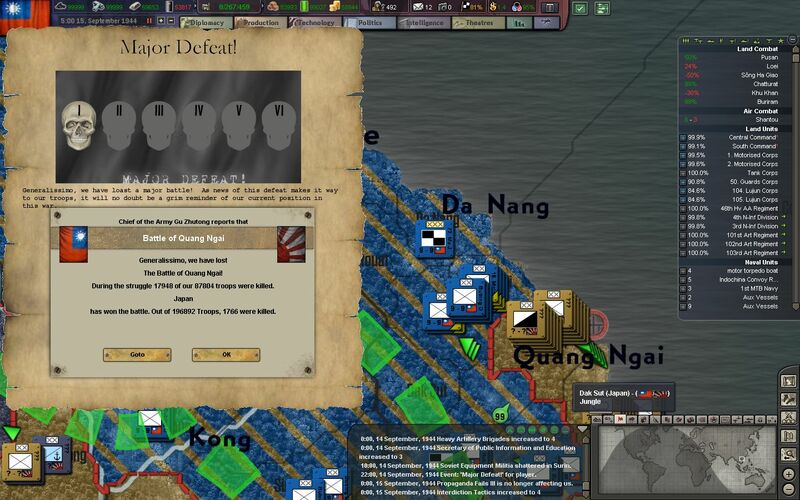 In an unexpected move, a Japanese field army is landed at the port of Quang Ngai, and begins to push our vanguard troops back across the jungle. 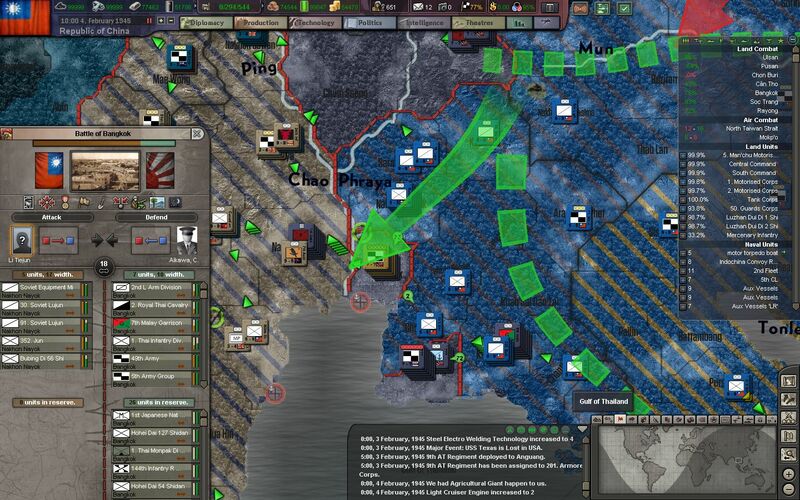 More divisions fighting in Laos are transferred to the coast to counter this attack. 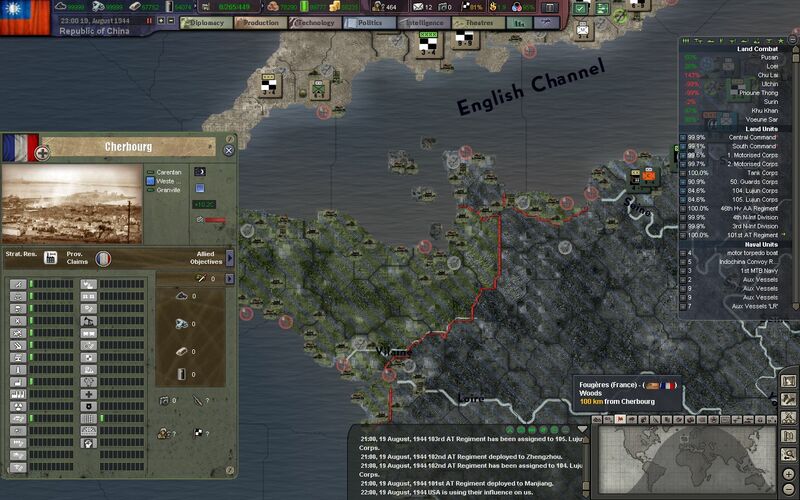 American forces, meanwhile, have taken the entire Britannian peninsula, including the cities of Brest, Loreint, and St. Malo. Another landing has been made at Caen, on Normandy, in order to cut off a large contingent of German troops at Cherbourg. The recent arrival of the 2nd. Mountain Rifle Corps has proven extremely valuable in the rough terrain of eastern Thailand. The drive south to Bangkok continues, regardless of the cost. 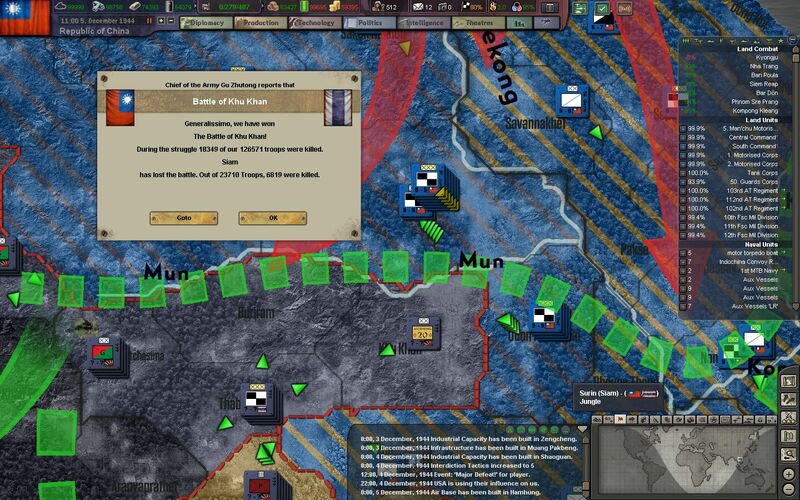 ...and Japanese forces call off their breakout from Quang Ngai in order to bolster their front to the south. Our attempt to capture the port of Quang Ngai fails, but now the bulk of the Japanese landing force moves south towards Saigon. Japanese armored divisions push our flanking forces back, and our troops near Quang Ngai prepare for more counterattacks. NRA forces to the West are told to slow down their offensives, to reduce the chance of being cut off from the main force. Two more light infantry corps are transferred to Indochina in order to bolster our lines and increase the pace of the offensive. 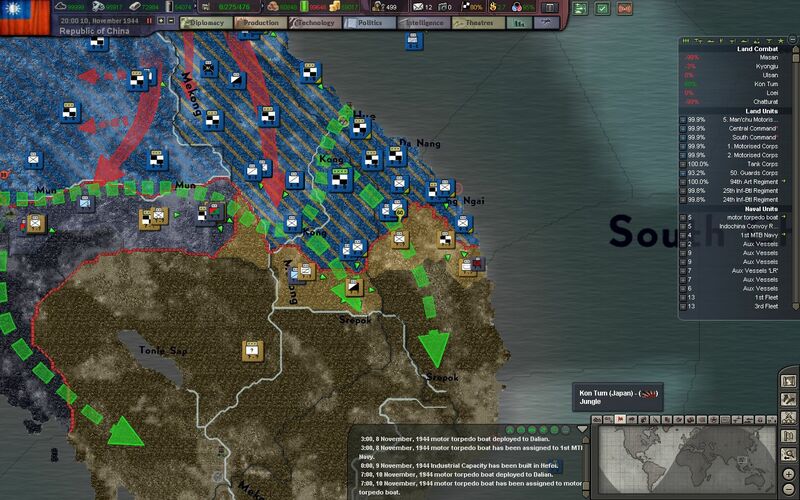 The secondary phase of Operation Ballroom is fully underway in South Vietnam, but our troops in Thailand are still being held up by dogged Japanese offensives. It seems our spearhead running down the Mekong River and towards the lake of Tonlé Sap will be able to reach the goal of Bangkok first. 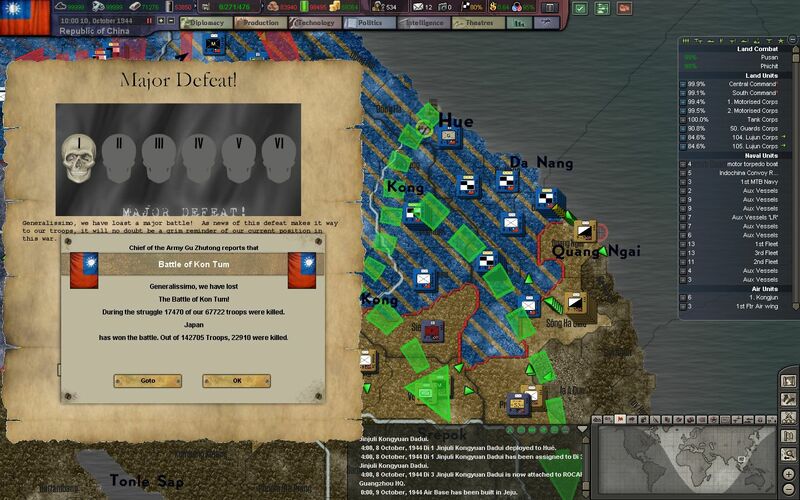 Our first attempt to cross the Mun River ends in failure as our troops are forced back after repeated and reckless Japanese counterattacks. The Japanese line will need to be thinned out more if we are to advance further. 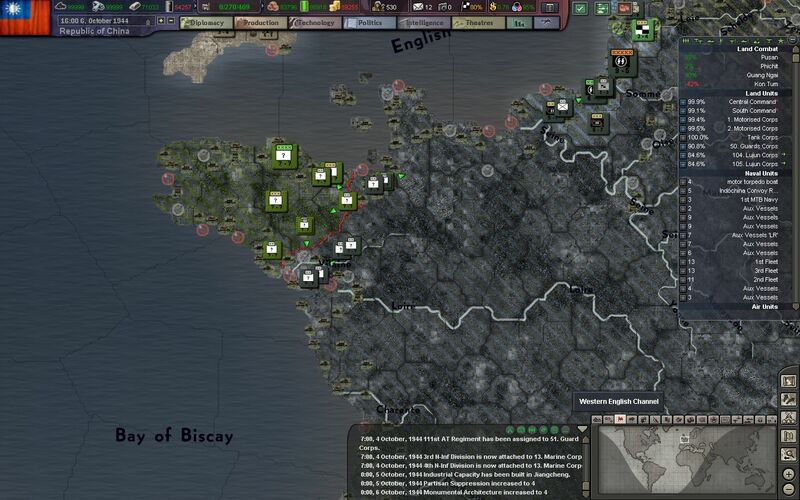 In France, it seems like the American landing at Caen has been forced back into the sea, as German panzergrenadiers retake the base of the Brittanian peninsula. 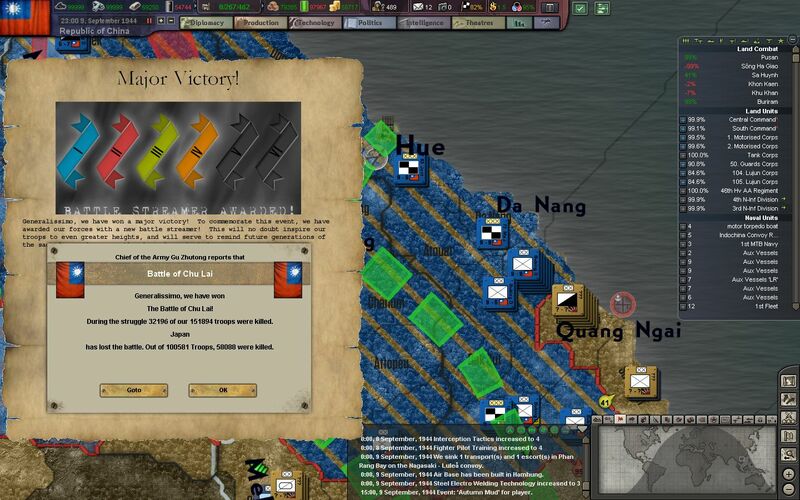 The port of Quang Ngai is finally taken after a lengthy battle, but it is no longer of any major importance. The majority of the Japanese landing force has already spread across our line and now forms a defensive ring around Saigon. Our drive south along the coast has to halt again after another bloody defeat at Kon Tum. 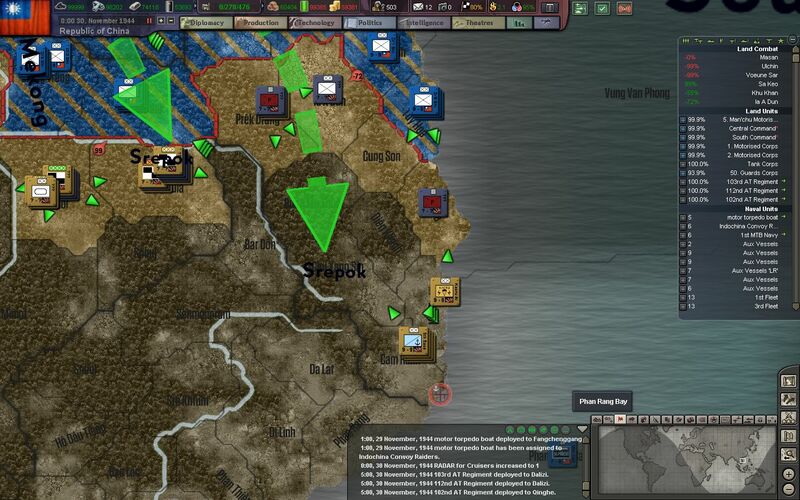 Our troops along the Mekong River, however, are pushing forwards as steadily as ever, and are set to reach the next objective of Operation Ballroom - the Srepok River. 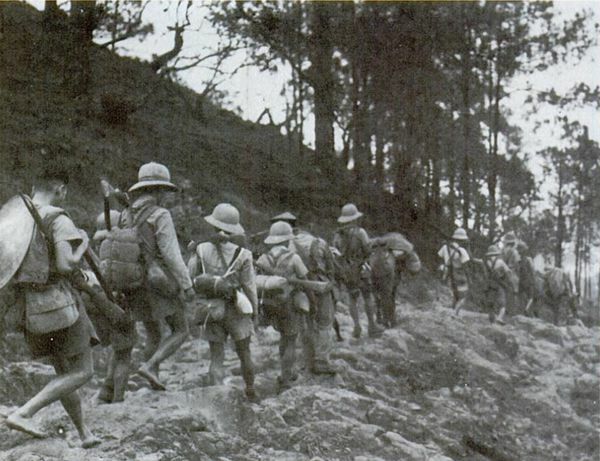 The growing gap in Japanese lines is forcing more and more divisions from their trenches in Thailand, which will give our troops there some room to work with. More reinforcements are spotted landing at Cam Ranh by our recon planes. 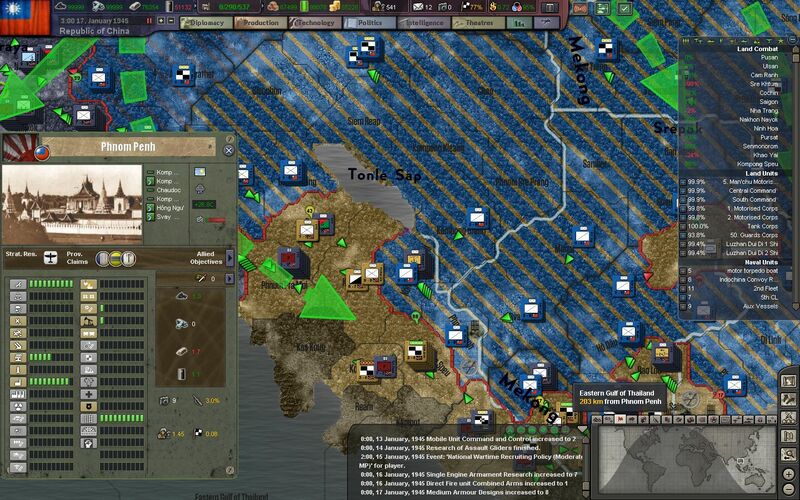 It seems like the Japanese and Siamese are confident in their defense of Bangkok and the Malay peninsula, and have instead decided to invest even more resources in the defense of Saigon and Annam. We are finally able to breach the Mun River, but at a great cost. 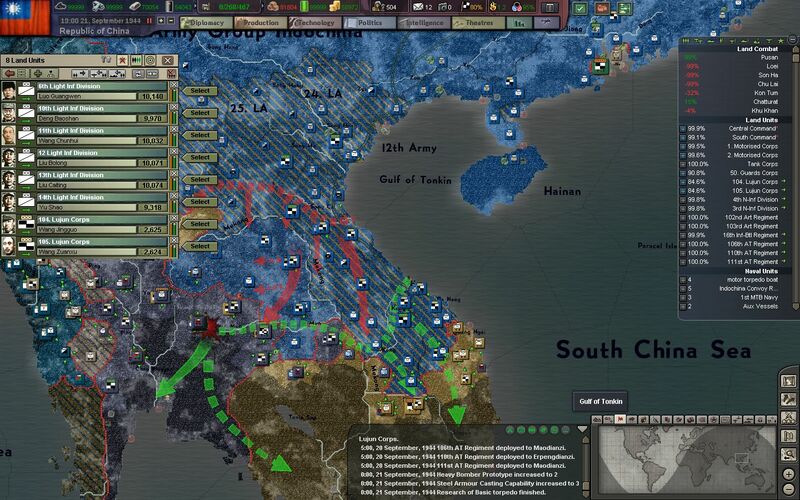 Although we will continue to make efforts to push south, Marshal Gu decides the best course of action is to swing south from Laos and Cambodia, and then to Bangkok along the Gulf of Thailand. 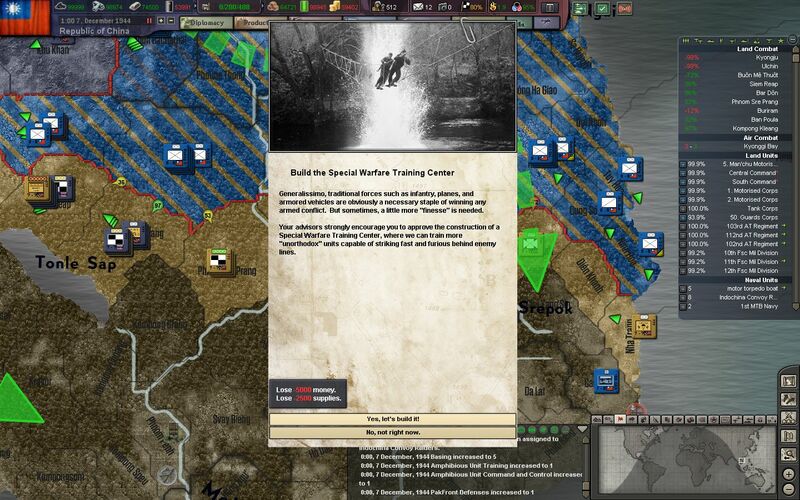 The inhuman fighting conditions in Indochina have compelled our leaders to build the Special Warfare Training Center on the island of Hainan. It has become clear that specialized and well-trained units will perform much better in Southeast Asia, rather than masses or regular infantry that have been employed so far. 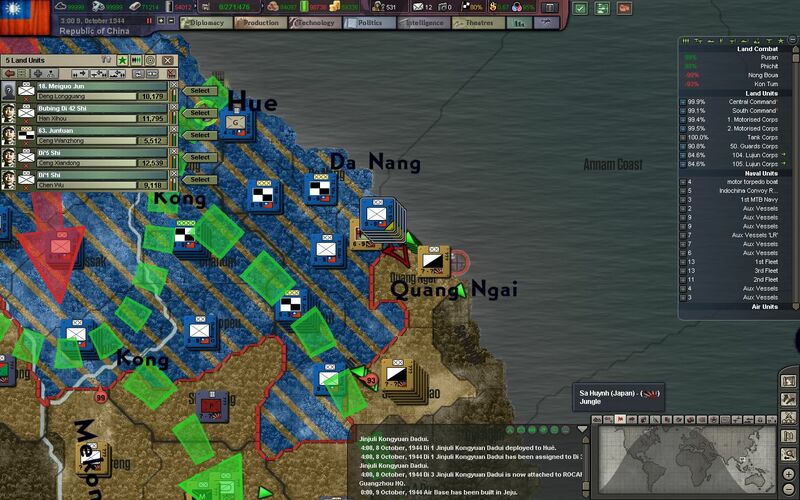 Japanese defenses in Annam begin to falter, as it becomes clear that most of the Japanese have fallen back to Saigon in order to force our hand in attritious urban warfare. 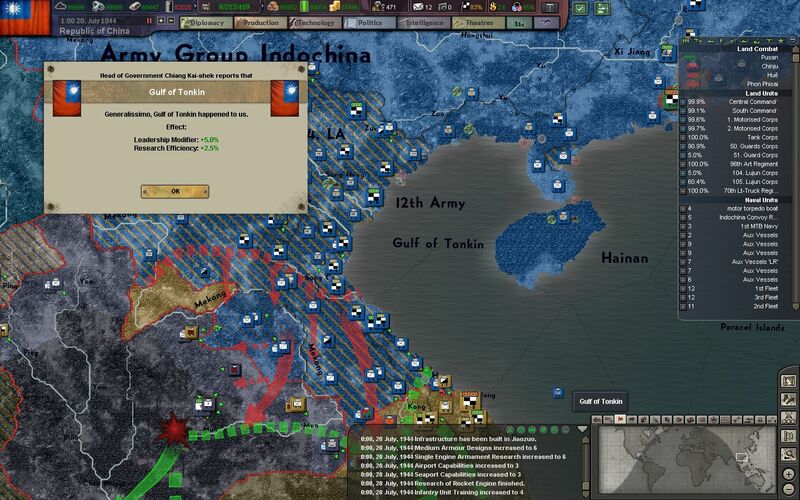 We are nearly done pushing the Japanese out of Indochina, and high command estimates that only a few months more are needed before Operation Ballroom is complete. Our recent successes have also allowed to British to push all the way to Bangkok. 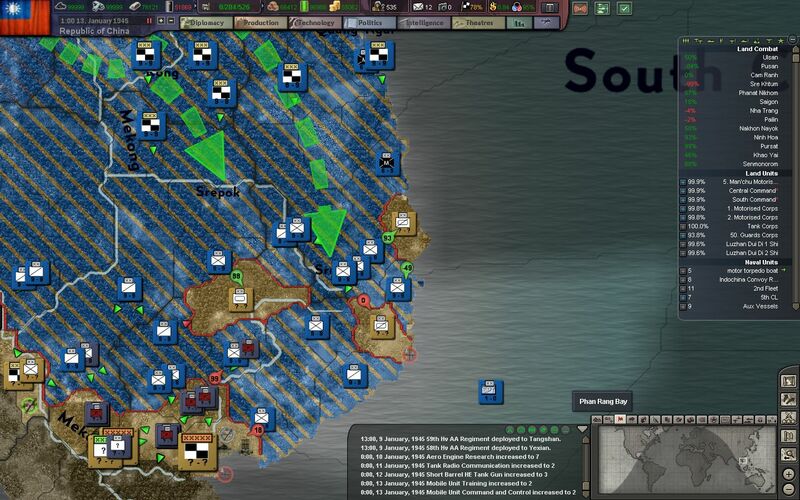 British colonial forces are reluctant to attack the city, however, as it is heavily defended by the Japanese and forces of Siam. 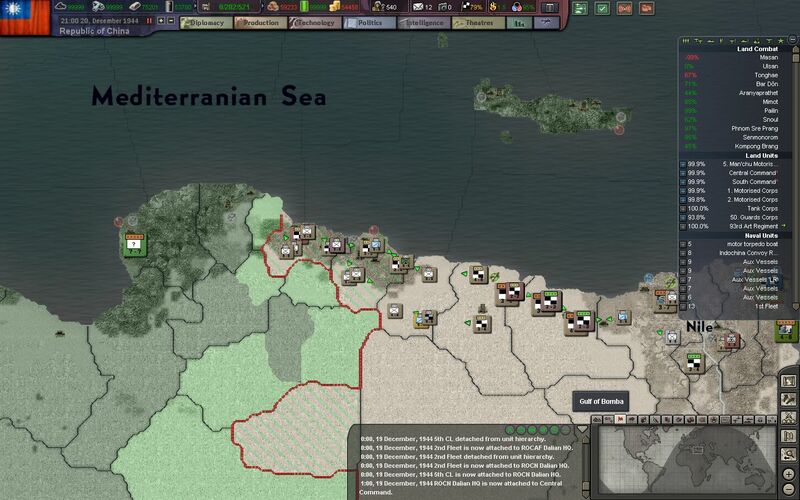 Meanwhile in North Africa, the Italian Army has completely collapsed after a decisive defeat at El Alamein. 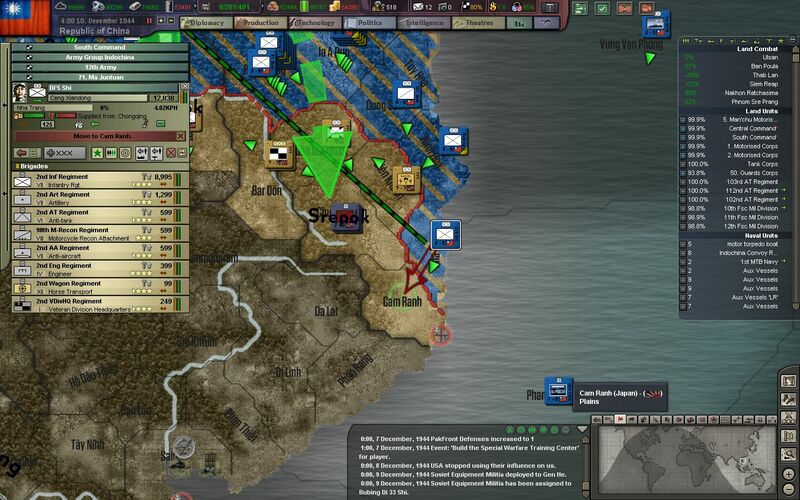 British and US combined forces now steam towards Bengazi with minimal resistance. And in Russia, the Wehrmacht leads a surprise "Winter Offensive" that reaches the gates of Stalingrad. How they did this, on strained supply lines, in the winter even, is incredibly surprising. 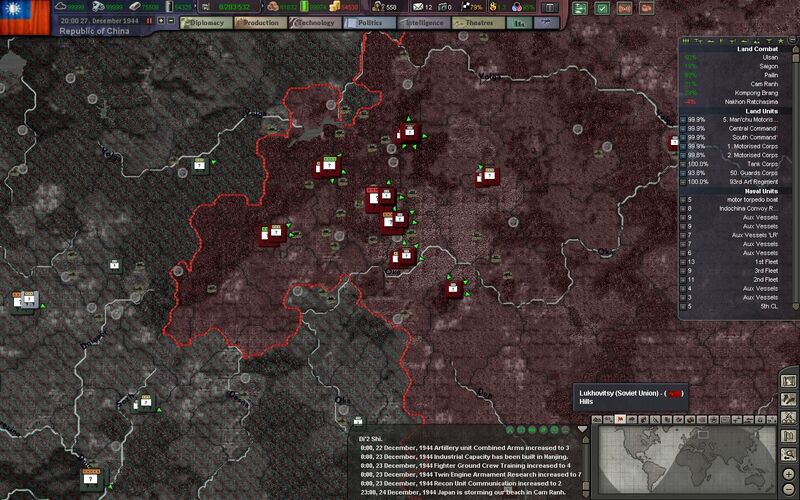 At the same time, the Wehrmacht's Army Group Center once again begins to knock down the doors around Moscow. Kalinin in the North is captured, and German forces advance on the Soviet capital from the North and the South. In another surprise move, the IJA has decided to land marines at Cam Ranh, which was foolishly left undefended by our troops racing towards Saigon. 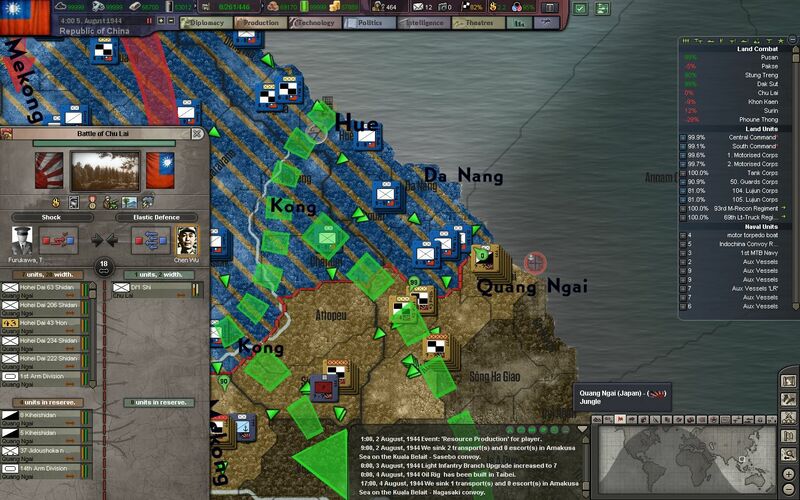 They intend to cut off our advance elements and push us back north to Quang Ngai. A holding action at Cam Ranh ends in a bloodbath, but it allows reinforcements to arrive and surround the Japanese invaders. 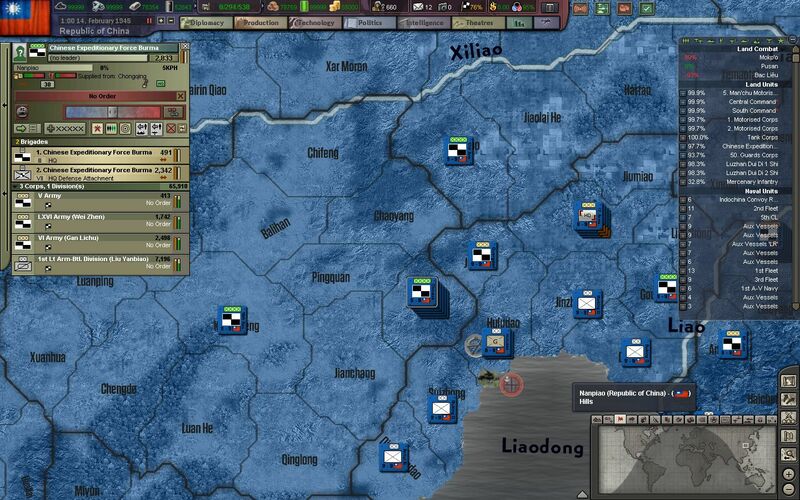 We also begin to ramp up our armored and automotive industry, by opening up tank factories in Zhengzhen and Changde. Our first marine divisions are deployed soon after in Dalian. These specialized divisions will be the first of many to come. The recent landing at Cam Ranh and a counterattack from Saigon has left one of our divisions cutoff from the rest of our force, but we will not give up our offensive. 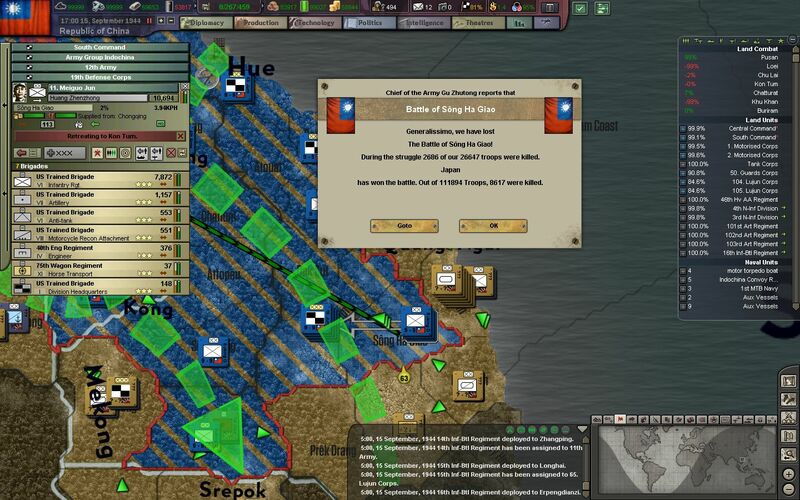 Our troops to the west at Tonlé Sap have crushed the resistance there and will continue to advance on Saigon from the west. Siam and the Japanese now only control a small stretch of coast and a thin strip of land north of Bangkok. 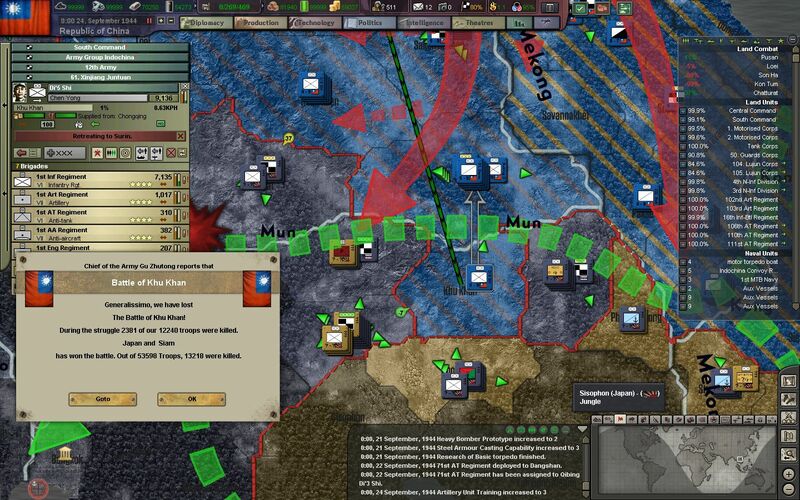 Enemy troops retreat left and right in an attempt to shorten the frontline and consolidate their defenses. The piecemeal landing at Cam Ranh ends in disaster. 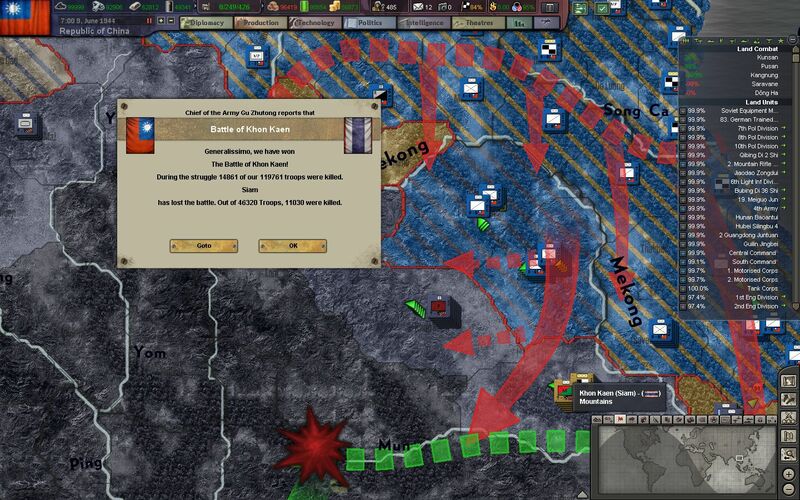 Reserve divisions from Laos have rushed in and surrounded three pockets of Japanese armored divisions - some of the last effective regulars the IJA has left, after considerable destruction in China, Manchuria, and Korea. The capital of Cambodia, Phnom Penh, is taken after a short fight. 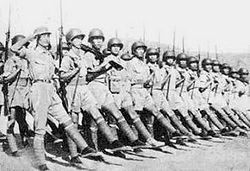 Most of the Japanese divisions in Indochina are at a strength of 20-30%, and many are replacements or local troops who have been forcibly conscripted by the Japanese. The end result is that all of our battles lead in the surrender of these unwilling participants, and the slaughter of the "honorable" Japanese troops. Saigon is finally surrounded in the North. IJA troops that were supposed to defend this last point of resistance were foolishly squandered in the counterattack at Cam Ranh, and all that is left to defend the city are the tattered remnants of IJA troops, along with one garrison division. Our first aircraft carriers are deployed to the 5th Fleet at Dalian. 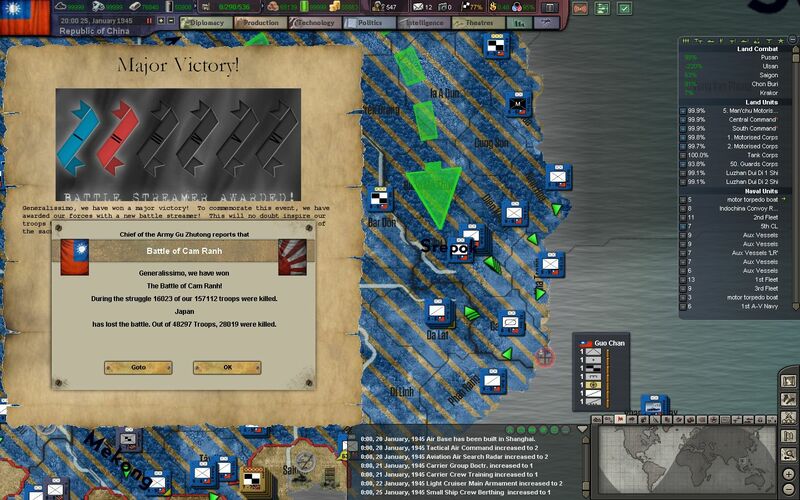 They will not see action for a while, as the Japanese Navy still reigns supreme over the Pacific. The final remnants of the invasion at Cam Ranh is crushed, with another 50,000 men of the IJA killed or captured. The Japanese will not be able to afford many more of these mistakes. 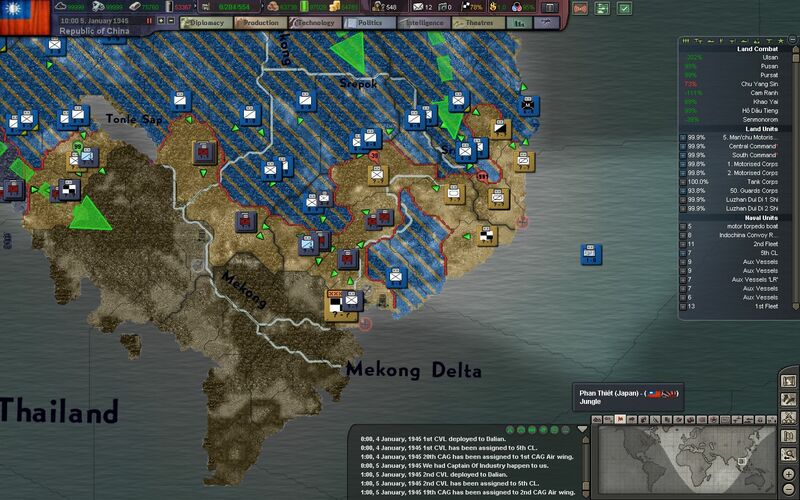 Indochina is nearly ours, as two main pockets of resistance have formed in Cochinchina. NRA forces have also reached Bangkok, from the east from Tonlé Sap, and from the North through Thailand, at the same time. Saigon is captured and the remnants of the Japanese force retreats south into the muddy marshes of the Mekong Delta. 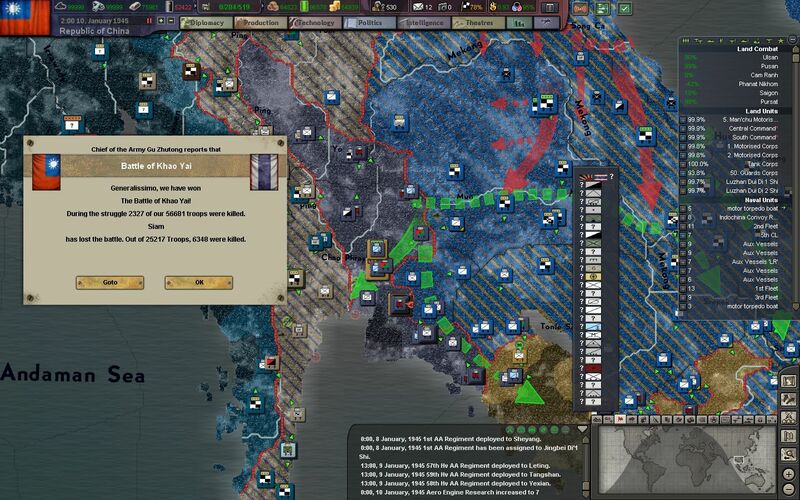 Chiang orders Army Group Indochina to assault Bangkok, without waiting for British assistance. 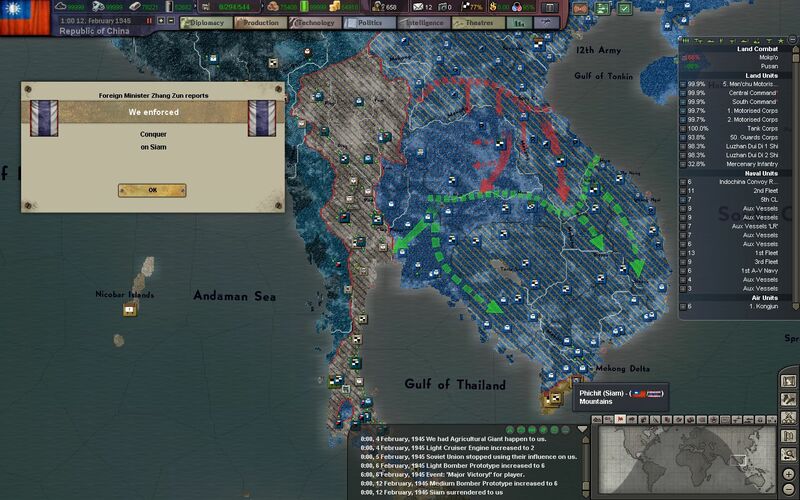 Swift maneuvers by our troops have managed to trap much of the Siamese army south of Bangkok, which only leaves a few tattered divisions to defend the city itself. 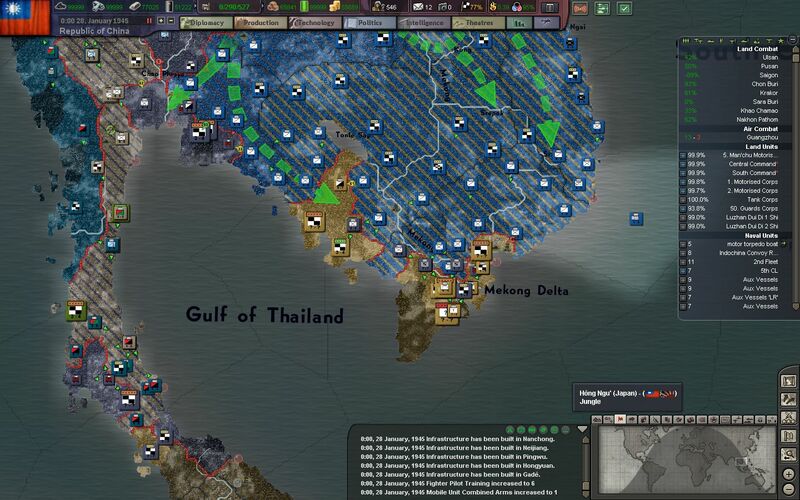 Our troops are able to secure Bangkok before the Brits can even enter the city. Occupation zones for Thailand are now evenly divided across the Chao Phraya River. Soon after, Japanese and Siamese forces in Bangkok capitulate. 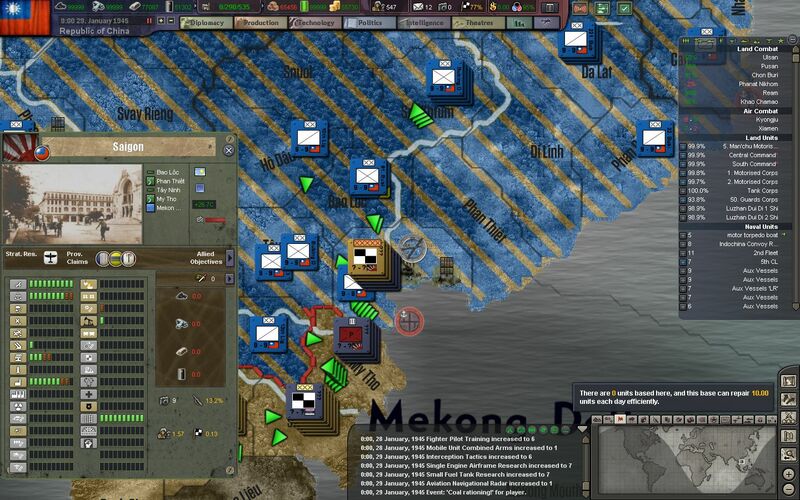 A small pocket of defenders still remains south of the Mekong Delta, and the Japanese are still expected to put up a fight on the Malay peninsula and near Singapore. 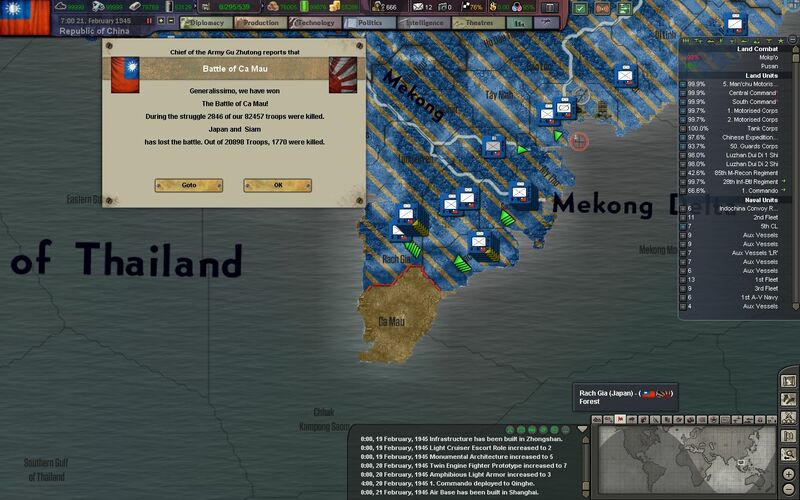 Emperor Bảo Đại, who was first a puppet under the French and then under the Japanese in Indochina, is captured by our troops as he fled from NRA forces advancing on Saigon. 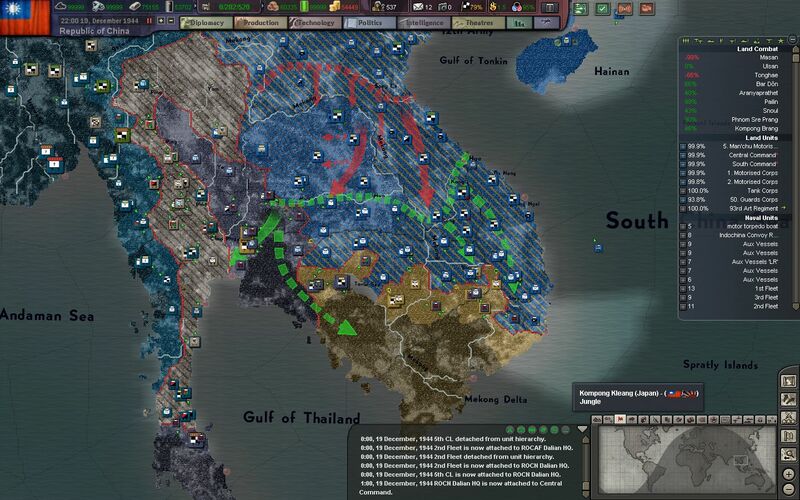 Chiang opts to decide his fate later, and for now places more military governments, based off of French protectorates, in power under the direct control of Army Group Indochina. 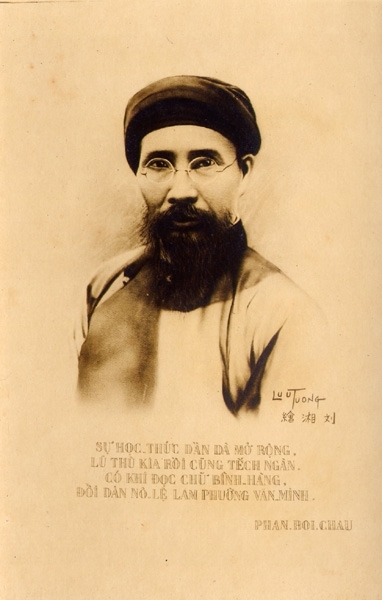 Prominent Indochinese nationalists, such as Nhất Linh and Nguyễn Tôn Hoàn, are called to the table to decide Indochina's post-colonial future. 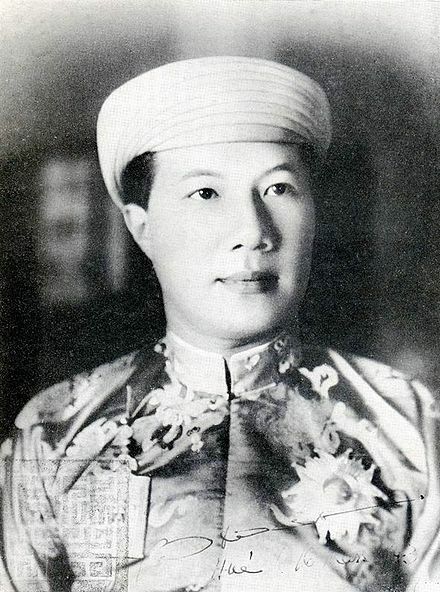 They work under the framework left by the late Phan Bội Châu (pictured above), a staunch ally of Sun Yat-sen - the founder of the Republic of China. French colonialists, and especially Indochinese Marxist-Leninists are left out of these meetings. 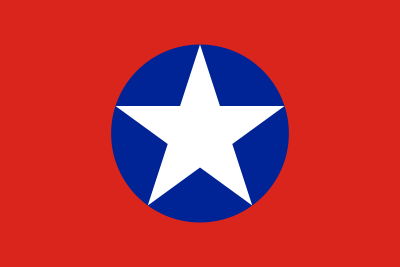 Together these nationalists rebuild and reform the Việt Nam Quốc Dân Đảng, or the VNQDD party. 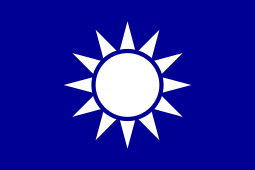 It models itself after the policies of the KMT, and although they are not given any power or jurisdiction over Chinese-occupied Indochina, they are the only party allowed to freely operate and negotiate with the KMT. 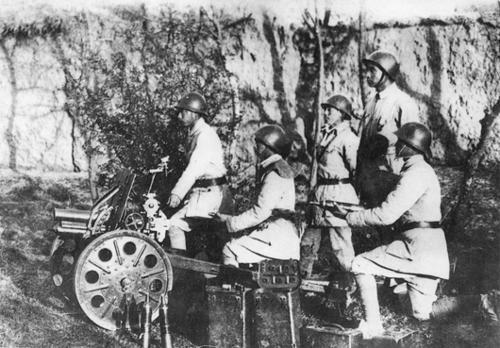 French colonial troops, who refused to fight either the Japanese or Chinese during Operation Ballroom, are stripped of their weapons and marched north towards Zhanjiang for internment. The denial of French rule over Indochina has begun to foul our relationship with the UK and the US, who still wish to preserve the colonial status quo in Asia. 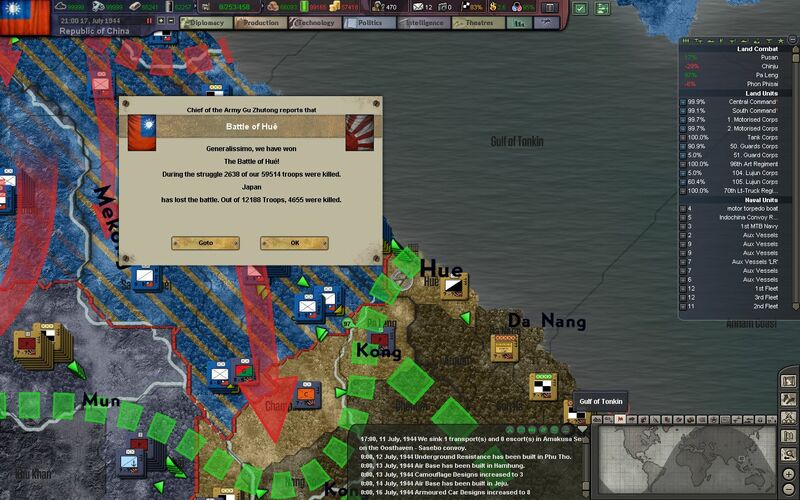 Although friendly to his allies in public, Chiang and the Kuomintang see the western powers as no different from the Japanese - wishing to dominate Asia and its "lesser" peoples. Indochina will be the first of many nations to escape the yoke of imperialism - whether it be from the Japanese or the western powers. 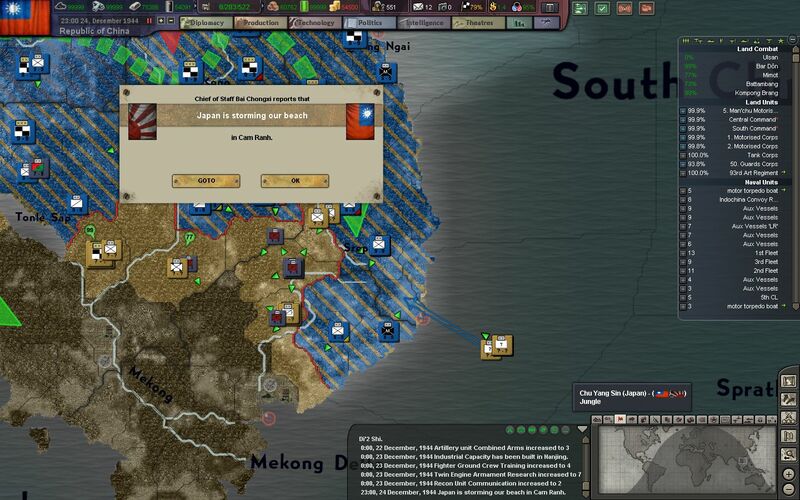 With growing tensions on the occupation border in Thailand, over the denial of French colonial territory, Chinese Expeditionary Force Burma is recalled from British Burma and placed back into direct NRA control. 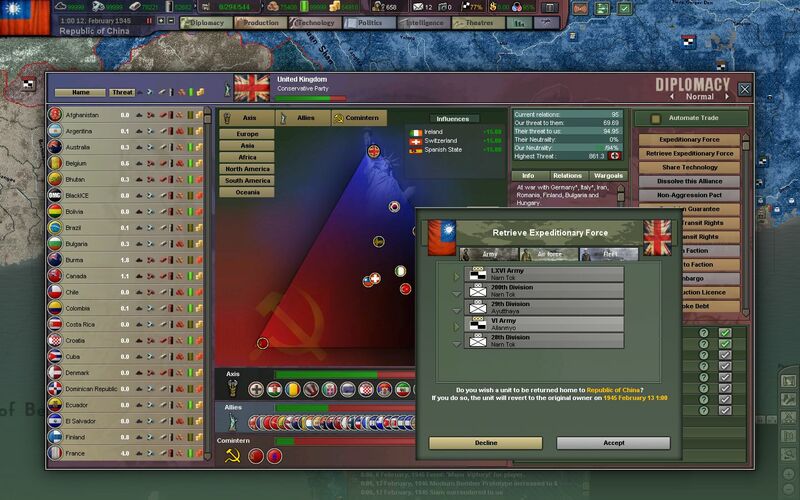 The Expeditionary Force, sent to aid the UK in their fight in Burma almost 3 years ago, is composed of three armies, 10 regular infantry divisions, and one armored battalion. These men are sent for retraining and rearmament after their arrival at Huludao in Northern China. 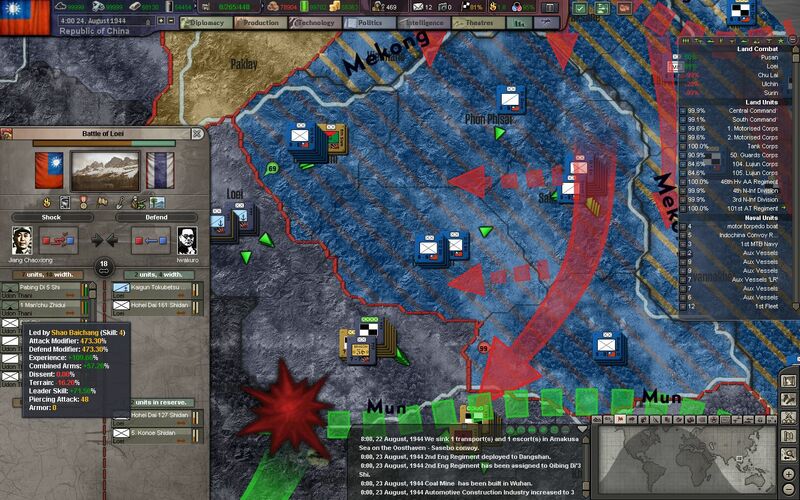 The final pocket of Japanese resistance is mopped up at Ca Mau, to the south of Saigon. Indochina is officially ours. 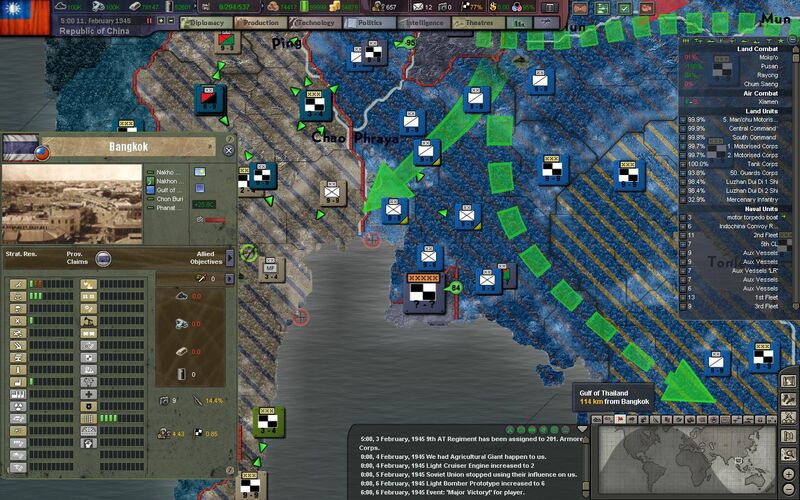 And in Europe, Allied forces open up a third front in Sicily, in order to help stem the Wehrmacht's offensives in the Soviet Union. 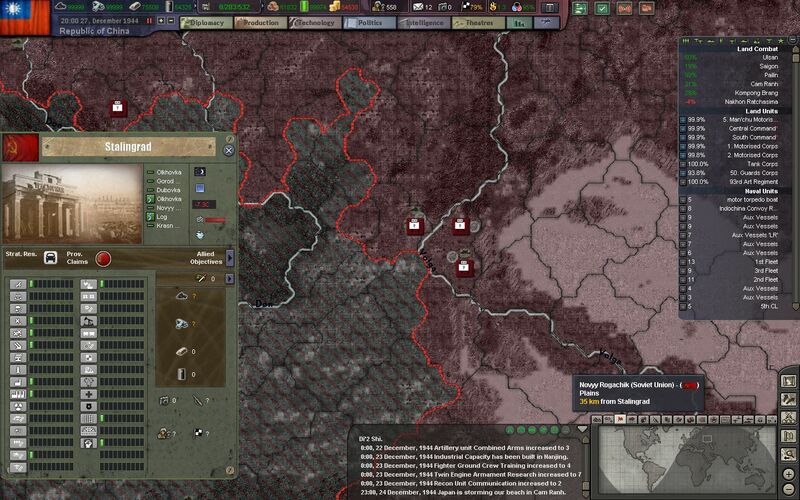 Note: I wrote some thoughts in a comment in the thread about the future of this AAR. Take a look if you're curious and willing to read through a long block of text.